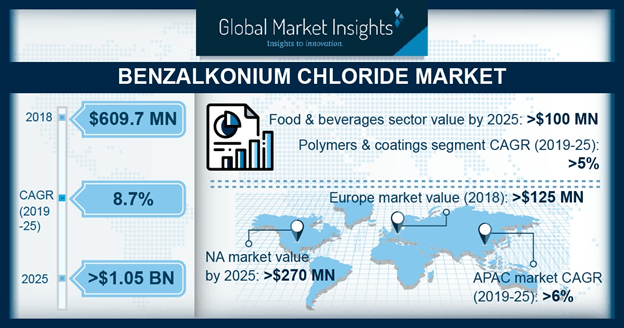 Benzalkonium Chloride Market size is set to surpass USD 1.05 billion by 2025; according to a new research report by Global Market Insights, Inc. Growing demand for medicines to treat lifestyle disorders such as obesity & diabetes, rise in ageing population and significant technological advancement in pharmaceutical sector should stimulate benzalkonium chloride market growth. The product offers high effectiveness as an antimicrobial preservative in eliminating yeast, fungi and bacteria. The product is routinely used in lozenges, contraceptives, surface & hand sanitizers, and wet wipes which is predicted to further boost the market growth. Germany benzalkonium chloride market demand from cosmetic industry may surpass consumption at 2.8 kilo tons up to 2025 pertaining to its efficient antimicrobial properties which prevents product spoilage. It has wide usage in facial lotions, makeup, sunscreen, foot odor powder and rash creams. It is less toxic as compared to conventional antimicrobial agents such as triclosan which makes it ideal for cosmetic application. This product offers crucial detergent, foam boosting and emulsifying properties which makes it ideal for eye makeup, skin cleanser and personal hygiene products thus boosting benzalkonium chloride market growth.